What is the healthiest stainless steel cookware? Stainless steel is a popular cookware material for good reason. For one, it looks great. More practically speaking, it’s durable, long-wearing and comes in a variety of shapes and sizes for all cooking tasks. But not all stainless steel types are the same. There are different qualities of stainless steel, depending on the quantities of metals used. Stainless steel is a combination of steel (iron and carbon) with added chromium and nickel to prevent rusting. There are certain grades and series to be aware of, as some are healthier than others. Read on to find out: what is the healthiest stainless steel cookware? You may also be interested in our article ‘which cookware is best for health’ here. 1 What are the healthiest stainless steel grades? 2 Okay…but which is THE safest? 3 Is there a way to prolong the life of stainless steel cookware? What are the healthiest stainless steel grades? All stainless steel cookware items will be stamped with a “grade” in numbers. This is often 300-series when it comes to cookware. This is because 300-series stainless steel contains both chromium and nickel, creating what we refer to as “food grade”. Chromium is what makes stainless steel resistant to rust. The nickel content is part of what helps the cookware to resist corrosion (as well as chromium). You will also see two numbers divided by “/”. For example, 18/10 and 18/8. This means that the metal has 18% chromium and 10% nickel, or 18% chromium and 8% nickel. 300-series stainless steel is very popular for cookware because it resists rusting and corrosion, so it will last a very long time. 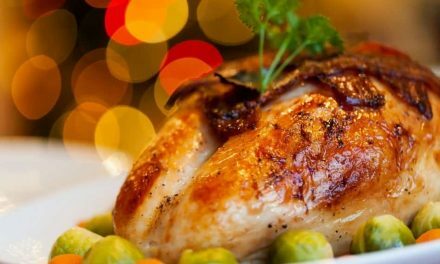 However, there are concerns surrounding nickel in cookware as small amounts can transfer into food. Some people should be more careful with stainless steel cookware than others, especially those with nickel allergies. For such people, stainless steel might not be the best choice and they would be better with a ceramic cookware option. Acidic foods are more likely to coax nickel out of stainless steel cookware, so it’s best to reserve your tomato-based sauces for more robust cookware. 316 and 304 stainless steel grades are very popular when it comes to cookware. They’re similar in the sense that they both contain chromium and nickel (remember those numbers separated by a “/”?). The key difference is that 316 contains a metal which 304 doesn’t contain, and it’s called molybdenum. Molybdenum is added because it makes the metal even more resistant to corrosion. It’s often used for construction in places where there’s a lot of corrosive salt and water in the atmosphere. Molybdenum is great for cookware because it helps to prevent pitting and increases the heat tolerance too. However, 316 generally contains a wee bit more nickel than 304 (about 2% more). 400-series is stainless steel which does not contain nickel. You’ll see the numbers 18/0 on 400-series stainless steel. This tells you that there’s 18% chromium but no nickel. While this is great for people with serious nickel allergies, it does mean that stainless steel is far more likely to tarnish and corrode over time. Okay…but which is THE safest? I hate to be a fence-sitter, but it does depend on your needs. If nickel is a real issue for you, go for 18/10 stainless steel, or another cookware material altogether. Otherwise, go for a 300-series choice with either 304 or 316 cookware. These are popular stainless steel types for cookware because of their corrosive-resistant nature. One thing I will say for sure is that you should steer clear of 200-grade stainless steel, it’s cheap (the bad connotation of cheap! ), it won’t last long and it’s more likely to leach nasties into your food. This is because the more the stainless steel corrodes and scratches, the more metal it will leach. I would say go for the 316 stainless steel because it is the most non-reactive and corrosion resistant. It might be a little more expensive, but it’s worth it for longevity. Is there a way to prolong the life of stainless steel cookware? 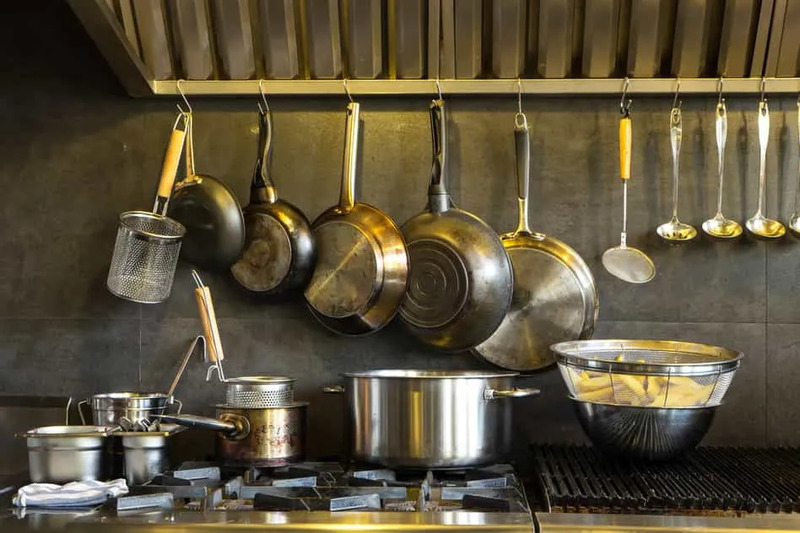 One of the best ways to preserve your stainless steel cookware and increase safety is to hand wash. The dishwasher can cause stainless steel to become tarnished and lose that lovely shine. Some detergents can be a little rough and cause pitting or corrosion, increasing the chance of metal leaching. Use a gentle detergent and a soft brush to handwash your stainless steel cookware, thoroughly dry then store. 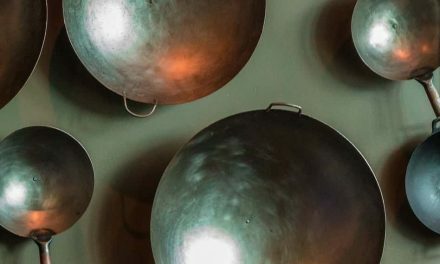 Stainless steel cookware has a core of either aluminum or copper which increases the heat conductivity (stainless steel alone isn’t so great at holding heat). Choose a brand which uses a layered construction, with a thick base to prevent warping. A thick base will also keep the pots and pans set sturdily on your cooking surface for an even result. It can be pretty tempting to keep your food stored in your pot or pan overnight (in the fridge) rather than transferring it into a container. 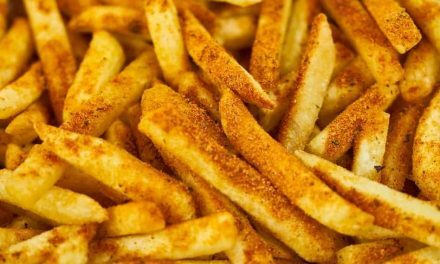 But resist the urge, as keeping food (especially salty or acidic food) in close contact with stainless steel for long periods of time will only increase the risk of metal leaching and corrosion. Pop leftovers into airtight storage containers as soon as you’re done serving up. Don’t rush into the washing-up process too quickly after finishing cooking and serving. Leave your stainless steel pots and pans on the stove to cool down before hand washing. Placing super hot cookware into dishwater can cause thermal shock, leading to warping and tarnishing. When it comes to stainless steel cookware, most people can be confident in its overall health and safety. The level of metal leaching from stainless steel with proper cooking practice (i.e. don’t leave acidic foods waiting around in stainless steel pans) is nothing to worry about. However, people with nickel sensitivities should choose 400-grade stainless steel, or another material altogether. Otherwise, 316 stainless steel is arguably the safest and most durable thanks to the mixture of chromium, nickel and molybdenum. 304 is also a very popular choice and is comparable to 316 in safety, but without the molybdenum, it’s ever-so-slightly less corrosion resistant. Be wary of 200-grade and stick with the higher-quality 300 series. 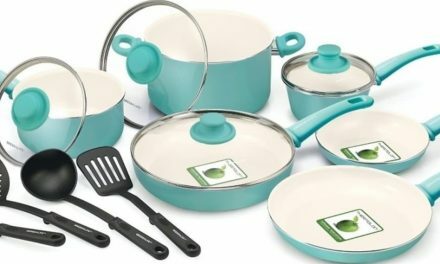 NextCan you use metal utensils on ceramic cookware?